Spicy tofu stir fry! Tofu cubes, red and yellow bell peppers, garlic and green onions, string beans and zucchini, roasted pine nuts and drizzled with a bit of honey and lime juice to make it sweet. 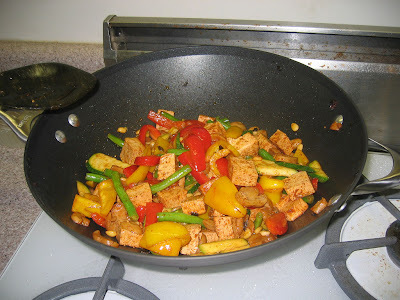 You roll the tofu cubes in a super-secret spice mixture prior to frying them.